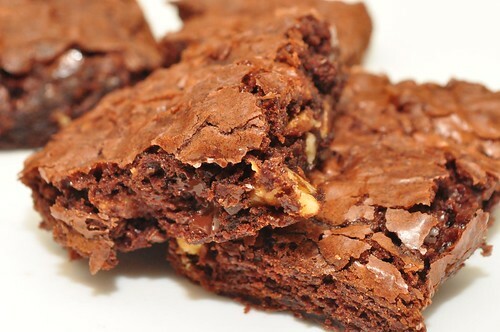 Brownies, the quintessential American dessert. You can make them much healthier by using pastured eggs, grass-fed butter, sprouted flour — so much better for you than using factory farm eggs, vegetable oil and refined white flour. If you're going to make brownies, make this healthier version. When you're craving a chocolately treat, these brownies are perfection. I know you are going to love them! This recipe was modified from the “All-American Fudge-Chunk Brownies” recipe in Richard Sax's fabulous and essential cookbook, Classic Home Desserts. If you don't have this cookbook, order it now. The man is a genius. If you are using sprouted flour, it is critical to add the extra egg or use some vital wheat gluten. I tried it both ways. Without the extra egg or vital wheat gluten, the brownies came out crumbly and dry. With the extra egg/vital wheat gluten, the brownies were moist, a cross between cake and fudge, with a beautiful crackly top. 2. Lightly butter an 8-inch square baking pan. Set aside. 3. Melt the unsweetened chocolate, butter, and semi-sweet chocolate in a saucepan over low heat, stirring occasionally. Set aside. 4. Sift the sprouted flour (throw away the bran,) into a bowl. Add the pinch of salt and 2/3 tsp vital wheat gluten. Blend well and set aside. 5. In another bowl, beat the eggs with an electric mixer (or a whisk) for a few minutes, until frothy. Gradually beat in the sugar. Add the vanilla. 6. Fold in the melted chocolate. Fold in the flour/salt mixture and blend. 7. Pour the batter into the greased pan and smooth the top. 8. Bake until a toothpick comes out almost clean, about 25 minutes. 9. Place the pan on a wire rack or trivet and let cool completely. Do not cut until completely cool. hmmm… I am not sure the gluten bit could be considered “healthy”. Gluten is not a whole food. “Vital” gluten is a refined protein from gluten-containing grains. It has not been fermented. All traditional cultures that ate gluten went through great lengths of labor to break it down. This included fermenting gluten-containing grains for very long periods. In addition, traditional gluten-containing grains where much lower in gluten than their modern counterparts, which have been bread for more gluten, precisely because it makes sponge baking so much easier, and you can make do without skill. Certainly NO traditional culture that ate gluten added more gluten to anything. One of the potential explanations as to why gluten-sensitivity has skyrocketed in the last couple of decades is because, more and more baked goods are produced in ways that sacrifice fermentation for speed. Modern breads use high-gluten wheat and non-fermentation processes to get that chewy texture without fermentation. I know 2/3 tsp. sounds like a small amount in a whole batch of brownies, but think that 10mg a day is considered too much for gluten-sensitive individuals. There are plenty of brownie recipes that are made with whole, nutrient-dense ingredients that are chewy and moist and do not even have flour in the recipe. I don’t have the book here with me, but in Super Natural Cooking, Heidi Swanson has the best brownie recipe I have ever eaten, and there is no vital gluten added there, not vegetable oils. As well-explained by Michael Pollan in Omnivore’s Dilemma, Industries have always found a way to make us eat their waste. “Vital” gluten is an industrial waste from the manufacture of gluten-free products. This recipe is not appropriate for people who are sensitive or allergic to gluten. For people who are allergic to gluten, I recommend the GAPS diet to heal the gut. I used to be gluten-sensitive but I took the time to heal my gut and I no longer have any problems digesting gluten. “Vital” gluten is an industrial waste from the manufacture of gluten-free products. “Industrial waste” is an overstatement. When we use the term industrial waste, we are referring to industrial waste products like fluoride and cottonseeds. Applying this logic, you could say the same thing about ice cream — ice cream is made from cream which is an industrial waste product from the manufacture of skim milk. That doesn’t mean it’s bad for you! This recipe makes 15 brownies, which means the amount of vital gluten per serving is 1/15th of 2/3 of a teaspoon. That is a tiny amount! I also said that if you don’t want to use it, you can use an extra egg. And again, this recipe is not appropriate for gluten-sensitive individuals. There are many more undiagnosed gluten-sensitive individuals than diagnosed ones. Those are the ones I worry about. Also, celiac disease, gluten sensitivity, etc are very difficult to diagnose. Is a boy who got rid of his gluten sensitivity but now has dyslexia and depression really cured? Not so sure. Gluten is not the devil. Present day gluten probably is. The idea of buying gluten, or fructose, or whatever, as an ingredient for baking doesn’t sound very appealing to me. Your initial recipe had gluten, which was at least partially minimized or broken down by the sprouting process. So it’s not true that the serving would be 1/15 of 2/3 of a teaspoon as you are not counting the gluten naturally present in the flour soaking doesn’t completely break it down does it?. In any case, if you react to it, you will react to a tiny amount. And again, a big percentage of sufferers are not aware of their sensitivity yet. I read your website because I am interested in healthy eating. I have stopped reading other websites like gluten free girl and the chef because they are all about muffins and cravings, and I don’t want to eat tons of almond flour of untraditional foods like xanthan gum – being a guinea pig won’t contribute to my health. By the way, what’s the new fad with “vital” gluten? Another health food like soy milk or agave nectar or “corn sugar”? I write a lot about GAPS and similar diets, healing the gut, grain-free and gluten-free cooking and last year I even taught a whole class that was completely grain-free. However I am not on GAPS any longer and I do eat wheat and other grains. I will continue to post recipes on the blog that have these ingredients. If you don’t like using these ingredients, you don’t have to make these recipes. QUIT FREAKING OUT ISSAC nobody’s forcing them down your throat! The point is that “Vital” gluten is not a food, its a by-product of the manufacture of products industrially, namely, gluten-free flours for celiacs. There is not gluten, as a pure substance, anywhere in nature or in any traditional cuisine. Your cream example is a good one, but you got it backwards. Skim milk is a by product of the manufacture of cream. Cream is the super food (which does exist naturally on its own as cream readily separates from cow’s milk). Skim milk is an industrial by-product that used to be fed to pigs. But how much more valuable is it to the industry as a “health” food? Skin milk should be avoided, as advised by WAPF, just like purified gluten as an additive. Again, that ingredient is of debatable health impact, Guyenet, for instance, argues that only 4% of people are genetically equipped to digest gluten. But the sad part is that it is completely unnecessary. There are perhaps a 100 recipes of brownies that achieve great texture without adding processed gluten. It is a shortcut. Take buttermilk. Buttermilk, like skim milk, is a byproduct from making butter from cream. Should it be thrown away or eaten? I’m soaking sprouted flour in buttermilk right now for buttermilk biscuits. Or how about whey, the byproduct from dripping yogurt to make farmer’s cheese? Is it bad to use the whey? Not at all – it’s considered one of the greatest health foods. Industrial waste products are called that because they were never really foods to begin with. Cottonseeds? Not food. Fluoride? Not food. Soy? It was not considered food for thousands of years — they didn’t even feed it to the animals. Until they learned how to ferment it and yes, fermented soy is very healthy in moderation. Gluten is food, just like casein, which many people are also allergic to. Just because they are allergic does not mean it’s bad for you. It’s just harder to digest than other foods. An industrial waste product is a secondary result of the processing of a product that could only be done with industrial technology. Making butter does not require industrial technology, and though buttermilk is a secondary product, it is a healthy and delicious probiotic liquid. Traditional cuisine teaches us to use as much as is healthy from a whole food. We do throw away some secondary products, like the foam of stock, because they are toxic, but throwing away buttermilk would be wasteful. Again, unlike pure gluten, no technology is required to make butter or buttermilk. Likewise whey requires no technology at all, so it is not an industrial by product. In fact, whey separates naturally from fermented milk just by letting it sit at room temperature for long enough. If you were trying to make whey, then the cream cheese would be the secondary product, or vice versa. In either case, both are natural results of fermenting milk, a process that happens spontaneously. I would not use the adjective industrial to refer to any of those. Cereals have always been second choice when it comes to traditional cultures. We learned to cultivate cereals because of growing populations and dwindling resources. Even then they have been prepared in laborious and time-consuming ways to minimize anti-nutrients and gluten. Cereals used to contain a lot less gluten than modern varieties that have been bred for more gluten. Even then, people ate cereals to fill the stomach, but always preferred animal super foods on an availability basis. Remember that dental problems in traditional cultures were only present in cereal eating populations. I do agree that individuals who are prepared to digest gluten can eat judicious amounts of it when its well prepared and never as a substitute to better food choices, just like our ancestors did. However, adding more, unprepared gluten of dubious industrial origin to a recipe that does not need it seems to me completely unnecessary and a waste of an otherwise great recipe. A bit more experimentation would probably produce equally good results without the industrial ingredient. However, these days, it is almost impossible to know if you are one of those individuals who are “prepared to digest gluten”. There is good evidence that many, many individuals who are not celiacs improve in health when they stop eating gluten. Dr. Natasha Campbell-McBride does say that some individuals who have healed through GAPS, after 2 years of the protocol and not before may be reintroduced to gluten containing cereals only if they have been properly fermented. Isaac, you are just slightly out of your element here. Most of us here are aware that cream naturally separates from milk. Good heavens! Cream is also not “manufactured” as stated in your post. No, skim milk is a byproduct of full fat milk; the word industrial has no place here. As Anne Marie has said, fluoride is an industrial byproduct. Not in the same class with animal byproducts in any way. You are pointing out the obvious here. Most of us already grasp the gluten use or non-use theory, and that is a subject like any other. Some people can and will use it, others won’t. It’s a matter of choice and is not “completely unnecessary”. If you choose not to use it, fine. In some forms of baking, it’s vital (pardon the pun). I beg your pardon? I was replying to a question by Ann Marie. She asked if buttermilk or whey should be called industrial waste products. I do not think that is being out of anybody’s element, as a regular reader of this blog I am free to post my commentary, specially if the bloggist asks me a question, until the moment she decides I should no longer do so. And I do no think it’s so obvious if we go around calling processed gluten a whole food. And cream is usually manufactured, made by hand, even if it does separate naturally. Because its faster and less prone to fermentation that way. Skim milk is a natural by product of that separation, but it has been traditionally not thought as good food for humans because of its low-fat, high-protein content and it was traditionally fed to animals. Just because its a natural by product it does not mean its healthy. > And cream is usually manufactured, made by hand, even if it does separate naturally. How is cream “made by hand” exactly? Are you referring to the process of skimming off the cream that rises to the top of a jar or vat of cow’s milk as being “made by hand” or “manufactured”? Small artisanal farms make it by hand by letting the milk sit and the cream rise to the top which is then scooped. My grandfather was a dairy farmer in the 60s and 70s. My grandma used to home-pasteurize the milk and the cream would rise to the top in the pasteurization pot which she collected. In larger operations centrifugal force is used. Yes, I am indeed aware of how cream is separated from milk. I suppose your use of the phrase “made by hand” seems rather odd in this context. The cows “make” the milk/cream, while farmers simply separate it via a very simple process. As they are not adding anything (for example, to make certain kinds of cheese) or employing complex processes (for example, making yogurt or sour cream), it’s hard for me to understand why anyone would say that cream is “made by hand.” When wheat and chaff are manually separated, no one would say that anyone “makes” wheat berries. In any case, thanks for the clarification. You are right. It was the wrong way to describe it. I used it to set it apart it from industrial technologies, which was my point. But re-reading it after you pointed it out I have to agree it does not make sense. I didn’t say skim milk was healthy. i wouldn’t touch it (to drink anyhow) with a ten foot pole. You are making this whole gluten thing difficult, and you’re having a really hard time convincing me that you understand raw milk at all. Anne Marie stated that the gluten was optional, in her first post, but that the brownies weren’t as good and fluffy without it. You shouldn’t come here and attack her and start spouting off about gluten. As I stated, most of us who read here are foodies who understand gluten, and Anne Marie has written about it before. Sorry, I didn’t mean to step on your toes as I didn’t realize you were answering a question from anyone. You were stating things so matter-of-factly. I am also free to post my opinions. We are all discussing ideas, Isn’t that the point? I am not the only one who disagrees with Ann Marie this one time. I am a regular reader to this blog and this is the first time I have voiced myself against something Ann Marie posted. I suspect she appreciates her reader’s impressions. Please point out where exactly have I been hostile to you like you are being to me? And I have not made any claims about expertise on raw milk. In fact I did not mentioned the word “raw” at all. I don’t mind your observations about my commentary, your hostility and sarcasm do seem gratuitous. You can point out your disagreement without them. Isaac, to be clear here — I’m not being sarcastic or hostile. You shouldn’t criticize the use of gluten for all. It’s one of those things that some people can use, others cannot. But it’s their choice. If it’s in a recipe and someone can’t use it, they will normally leave it out or substitute it with something else. And for most of us who are into the WAPF way of eating, raw milk is what we mean when we talk about milk at these blogs and forums. We do not usually include pasteurized milk in anything because it’s not healthy. I didn’t say you have expertise in raw milk, I said I don’t think you understand raw milk. Real, raw cream, no matter how you want to state it, is NOT manufactured – not by hand or any other way. It’s a natural byproduct of separated milk, whether it is separated naturally by just sitting in the fridge, or whether it’s done with a machine called a separator. No heat is involved using a separator though. If you were offended by some of my comments I’m sorry. Wow a little gluten really stirs up a lot of ire! Sorry, folks — didn’t mean to cause such controversy. The fact is that gluten is simply another word for the protein that is found in some grains. I do not believe it is inherently bad. Gluten does not cause gluten intolerance, nor does casein cause dairy intolerance. The root of the problem is a damaged gut with abnormal gut flora. What causes a damaged gut and abnormal gut flora is NOT GLUTEN. What causes this primarily are things like antibiotics, the birth control pill, chlorinated water, etc. Gluten intolerance is a sign of an unhealthy gut. Just like very high “bad” cholesterol is a sign of inflammation. Yet high cholesterol does not mean that cholesterol is bad. It is just a sign of something else. Let’s not throw the baby out with the bathwater. And by the way, I want to say that I appreciate EVERYONE’s comments. I really do! You guys keep me on my toes and I love that! Thanks so much for sharing what you think — we are all on this journey together and we’re all learning together. Ah, I like you cheeseslave. Calm and Tactful. D, may I call yo D? I do understand, a lot more than you think. Like I stated I grew up in a small dairy farm. Not in the US of A, and not in English. The term “manufacture” was a clumsy slip of the finger from a English-as-a-second-language commenter. I have already acknowledged that to Jeannette, who pointed it out a bit more clearly than you did. But there is a whole world of a difference between well-fermented (or sprouted) natural gluten and and industrially processed product, like “Vital” gluten. This is what I was pointing out to her, the use of an industrial processed food. This is similar to adding corn syrup to the recipe. None of us at WAPF would do that. It is not a natural whole food. And it is not healthy. Notice I did not criticize the gluten in the flour she used, which has some gluten in its natural form and it was sprouted. Above all, I think she could very well manage amazing brownies without the added gluten. Brownies have been baked for decades without adding extra gluten and it defeats all the great effort and amazing ingredients she otherwise added to the mix. Sarah, The Healthy Home Economist, seems to agree. A lot of people come to this an other blog’s (Like Sarah’s) for guidance. They are struggling with bad health or recovering from it. I think both Ann Marie and Sarah have placed awesome responsibilities on their shoulders. When something of dubious health impact is posted, it is good that there is debate because those readers will be able to see that there are differing opinions on the matter. I still don’t have any evidence that vital gluten is bad. But yeah, not ideal — if I can achieve the same results with an additional egg than I would rather not use it. That said, I will test the brownies with an additional egg and see if that solves the problem. Just not this week! :-) Enough brownies! A good guiding light on this point is Pollan’s advise. New products should have the burden of proof about their safety, and not the other way around. We don’t need to worry about cream, because people have been eating it for thousands of years in super healthy populations. New fangled products, however, are not known to be safe, because nobody has been eating it for any extent of time, so it should be up to the product to prove its safety before it becomes adopted. In other words, we don’t need to wait for evidence against it to stop eating it, but evidence about its safety to start doing so. A case in point would be bran. We know cereals have bran and because we ate cereals safely, we thought bran would be safe too. We all embarked into the great bran experiment. Now, 40 years later, we know bran is horrible for you when out of the context of a cereal. Likewise for fructose, etc. A industrially purified ingredient is not the same as that same substance in its original context. I personally avoid vital wheat gluten and never use it. It completely defeats the purpose of using the sprouted flour. Breakdown of gluten is one of the primary reasons for proper preparation of grains. If you need something to hold the brownies together as sprouted flour is very crumbly (because all the gluten has been broken down via sprouting and gluten is the “glue”!) then use xanathan gum. No one digests gluten properly even if you supposedly have no symptoms. Much damage from gluten is completely asymptomatic. I remember when I was nursing my kids, if I ate even a bite or two of a wheat based food that was not properly prepared (that is, the gluten was not broken down) then they would spit up where they would never reflux otherwise. Adding back vital wheat gluten to a traditionally prepared baked good would undo all the good from sprouting the flour in the first place. Saying that adding a tiny amount of vital gluten “completely defeats the purpose of using the sprouted flour” is an exaggeration. If sprouting grains removed all the gluten, then you might have a point. However, sprouted flour contains gluten, too. If you or you kids have problems digesting wheat, the issue is not gluten by itself. According to Dr. Natasha Campbell-McBride, eliminating gluten does not solve the problem. She says that gluten intolerance is caused by abnormal gut flora and a damaged gut which is the root of the problem. I used to have symptoms when I ate gluten (excess mucus, allergic reaction, fatigue, etc.). After I healed my gut and took therapeutic grade probiotics for 2 years (this was in my 20s,) I found that I could eat wheat products with no symptoms. Neither gluten or casein are “bad”. A damaged gut is incapable of digesting more complex foods like gluten and casein because the villi is damaged. The villi is what secretes the enzymes that allow you to digest these disaccharides and polysaccharides. By building up the good gut flora and avoiding foods that you can’t digest, you can heal the gut and most people find that they can eat gluten and casein again. Again, if you don’t want to use vital wheat gluten, you don’t have to — I think the extra egg will work. I just haven’t tested it yet. Two pans of brownies in one weekend is enough! This is more brownies than we normally eat in months! These look great. I understand the controversy around vital wheat gluten. I have a recipe that I have adapted from Sara Moulton’s Triple chocolate brownies, that are completely gluten-free and could be dairy free, if someone is allergic. If you want i could email you or post the recipe. It uses coconut flour as the flour. Mine come out less thick than regular brownies, but very delicious. And people who are into tinkering with recipes, might make it suit them better. Oh MY this sparked some debate. I’m impressed with your patience and professionalism in dealing with responses – it’s all interesting. I don’t know “vital” so it’s all new to me. The brownies look great, though, and I think it’s great that you supply recipes for different preferences, or different “stages” perhaps. In my opinion, there is no “unhealthy” food which defeats the purpose of eating healthy foodstuffs too. Allergies and intolerances are a different ball game of course, like you mention. You mention also that you’ve been intolerant to gluten and you are able to digest it now – it gives me a bit of hope :-). If you are at all still in the mood to answer replies could you tell me, would there be any point in preferring sprouted flours if I ever get to a point where I’m thinking about re-introducing some grains? Did you know you could replace the “Vital Gluten” with potato flour? I use potato flour from either Bob’s Red Mill or King Arthur Flours. It is gluten free, and not the same thing as potato starch at all. One thing I like to do in brownies is to replace the solid chocolate with cocoa (raw cocoa powder) and coconut oil. Another place to use coconut oil! It adds such moistness to the brownies. Thanks for the recipe, I’ll be giving it a try! You can also buy and use organic raw cocoa nibs. I like them ground up just a bit and added to the coffee grounds in my coffee maker. Adds an interesting, different perspective to coffee as a once-in-a-while treat. I only drink 1 cup of coffee daily (organic beans which I grind myself). Coffee is lovely stuff. I usually add a big tablespoon or so of real, raw cream to my coffee, too. What a lovely start to my day. From my reading and studying of WAPF principles for the past 14 years, there have been times when Sally advocated very strict avoidances of certain foods, and times when she has said that it’s not good to be too strict and any improvement you make will help. I do think it is useful to be educated about the pluses and pitfalls of various foods. If you have a chronic stubborn health challenge, I can see being more strict about your food choices. I have read that Sally had digestion problems, which probably led to the emphasis she puts on digestability. I, on the other hand, have never had digestion problems. I do consume a lot of whey and kefir and raw foods for the enzymes. And I both sprout and soak my oats, and make homemade sourdough bread. However, if I occasionally have a cookie with white flour and sugar (but NO HFCS) and chocolate, I don’t sweat it as long as it’s truly occasional, like once or twice a month. I also don’t get upset if I occasionally have white bread at my mother’s. She makes most things from scratch, but buys bakery bread. Sure, it’s not perfect, but it can really make you crazy to be “perfect” all the time. I find that if I get too perfect, it can cause stress that probably partially undoes all the good I am doing by eating so well! I buy the best chocolate I can find and afford, and have it rarely. And I don’t worry about it. When I feel ill or out of sorts, I am very careful to avoid marginal foods, but I really don’t think an occasional overindulgence will kill me. After all, I am sure that when ancient people ran across a beehive or a maple tree at the right time, they might overindulge. But they weren’t finding such things every day, so it wasn’t that much of a concern. I also would like to add, that if you read the section of the WAPF website where the members of the board post what they eat, Sally’s diet is exactly what she advocates. However, to my personal amusement anyway, her coauthor Mary Enig drinks coffee and drinks a lot of raw milk but always puts chocolate powder in it. Another member of the board drinks tea regularly. I drink organic tea (less fluoride) and usually partially decaffeinate it by doing a presoak of 1 minute, which can reduce the caffeine by 30% to 80% (depending on which web site you read!) I don’t drink coffee, and I love tea — you have to enjoy life, too. Also, the purpose of brownies is as an occasional treat, not as a part of a daily food regimine. That’s why we all refer to them as treats, right?! I drink tea sometimes and like to make my own chai tea, but Earl Gray or Princess Gray is my next favorite. But in the morning, after my warm lemon water, I like my cuppa coffee! Hey I have an alcoholic friend who drinks beer for breakfast – and I’m not talking about good homemade kvass or anything either! In the scheme of things, I’ll stick with my coffee until and unless they prove beer is really good for me. Thanks for posting a “good as you can get” fun recipe like this. Personally, I think food is so much more than about certain ingredients (although very important). To me food also brings a great deal of pleasure, fun and creativity. Our attitude toward a food just may affect how we digest it. Just a thought! :) Happy eating! I agree — it’s important to enjoy our food, and have fun with it! I really appreciate the recipe! Can’t wait to try it~ I just started making my own sprouted flour and am trying to expand my recipe selection. I have had some luck just substituting it in my favorite recipes, and then sometimes that does not turn out so good! I really do like the idea of it however, because try as I might, I can not get my kids to like anything soaked or soured. I like that I can just keep it on hand and whip up something healthy. Can I ask, does sprouting the grain, then dehydrating in remove all the phytic acid, or is it at least equal to soaking the grain overnight. I agree that treats like brownies shouldn’t be for every day. However, if I have to choose between my kids eating those or eating something from the store that is full of refined sugar, white flour, MSG, preservatives, artificial colors and who knows what else…I’d choose a smidge of gluten or a little naturally sweetened chocolate any day. We live in a modern world and it’s very hard to avoid everything bad! That said, chocolate is not something we eat every day. It is a special treat that we only eat occasionally. Q. Please tell me why cocoa (chocolate) is or is not a good food. A. Chocolate is a tough one. I do not want to tell you that you should never eat chocolate, nor will I say that I have never eaten chocolate myself. But it should not be consumed habitually. It is somewhat addictive, enhances the sensitivity of endorphin receptors (thus can cause a let down afterwards), contains a caffeine-like substance and also needs to be sweetened. So try not to make a habit of it. We do not allow products with chocolate at our conference or in our shopping guide. Thank you for sharing your recipe and tricks! Would it be possible for you to include photos of your own brownies, so we can compare our results to yours? Sorry Julie I didn’t have time to take a photo. I will be teaching a class on preparing grains in April so you can see videos of everything I make. AnnMarie, are there nuts in the ones you made in the picture? It looks like walnuts or something like that. Not that it really matters if they are there or not: I’m making these tomorrow and walnuts are going in (soaked and dehydrated of course)! I see now that it looks like that’s not a picture of YOUR brownies. But still. Walnuts. In mine. Fo sho. I wish I had time to take photos — but you know, I’m working so hard to quickly test recipes and get the posts up, I don’t usually have time. We can’t do walnuts. Katie is allergic to nuts. But yeah, otherwise I would have totally added them. Speaking of substituting carob, I believe carob products are usually made with at least partially hydrogenated oils (since carob itself is not as rich as cocoa, they have to add some fat to give it a chocolately texture)…or are some brands made with healthier ingredients? I’ve always avoided solid carob products for that reason; I prefer the natural fats in good quality chocolate. I think we’re just talking about carob powder and such — but that’s a good point — need to always check the labels! You did mention in one of your comments that you were going to try “carob chips” among other substitutions. As a former health food store owner, I was always kind of turned off by the ingredient lists of carob chips, and noticing how many people thought they were healthier than chocolate. Did you know there are quite an array of different carob chips? Many different ingredient lists??? The carob chips I buy are made from carob powder, malted barley, oil and lecithin, and I buy them because the initial processing of the carob is healthier. Chocolate makes me react because of the INITIAL PROCESS. So for people who REACT(or who don’t want to start reacting) it is better when their indulging (even having sugar, corn syrup whatever) than to deal with the problems chocolate gives. They know their indulging either way! I received this information this morning in my Farmer’s Almanac e-newsletter and thought I’d share it here, since we’ve been discussing chocolate. If you bought the organic cocoa butter and raw cocoa powder, this could be a fun Valentine’s Day thing to try! I can’t find in the recipe instructions when you use the semisweet chocolate in the making of these brownies… can you please explain where this comes in? It is the first instruction. You melt it with the butter in step 1. Jennifer, I’m so glad you asked that! I was just baking these this morning & got to the end, where I discovered my semisweet choc leftover ;-). It also took me 40 minutes total baking time. Maybe I’m at a different altitude or something. The end result is super delish, though!